Tagged "ZOOKEEPER DX Touch Edition"
I beligerantly maintain that Zoo Keeper was, and is, the best game for the Nintendo DS. GameRankings disagrees, but GameRankings is wrong. 193rd? Shove it up your arse, GameRankings. It took a long time for it to make the natural transition to iPhone, but now that it has, I thought I should assess some of the contenders for the match-three crown. It’s not as good as the DS version. That has to be the starting point, I’m afraid. 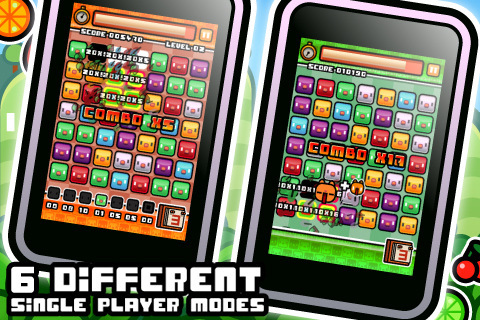 Only two modes have made it over: normal (levels require an increasing number of each animal to be caught) and tokoton (catch 100 of an animal to level-up). Meagre. Not only is there not as much game as the DS version, but what there is isn’t as well balanced. The specific problem is the sudden speeding up of the timer when rabbit is added to the mix. It’s a difficulty spike not present in the DS version, and it’s not terribly welcome. But still, it’s a ruddy good match-three game. The animals are as charming as ever – possibly more so in glorious pin-sharp resolution – especially when they’re the only animal you need to collect to level-up, and their faces go all grumpy. Wonderful. It’s also still the best match-three for bringing it back from the brink: even when there’s virtually nothing left on the timer, a good run of matches and combos can replenish to back to a healthy level. And doing so remains a joy. Before the official version came along – with its shouty all-caps contraction of a title – Piyo Blocks 2 was pretty much the iPhone version of Zoo Keeper. If it wasn’t so good, it the similarity would be shocking. In fact, overall, it’s better. The only negative I have is that once the timer gets low, unless you can get to the next level, it’s pretty tricky to recover – the amount the timer gets replenished is just a touch too stingy, to my mind. Oh, and it’s not quite as sharp looking. The animation is a little smoother, though. There are generous additional modes, two of which are rather fine. 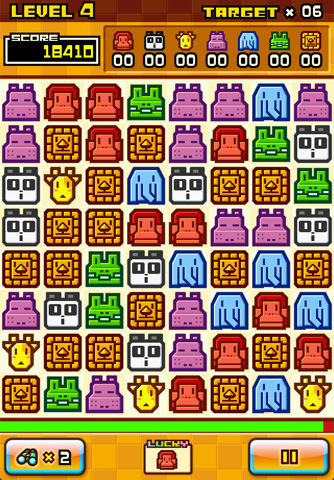 Three second mode gives you, yes, three seconds to make each move, and is delightfully relentless. Disco is even better: it’s all neon colours, and every so often the blocks all change colour, keeping you on your toes, and making for some incredible combos. The power-ups are nicely implemented too, and achievements add welcome targets somewhat more reasonable that the worldwide high score tables. It’s the full match-three package. 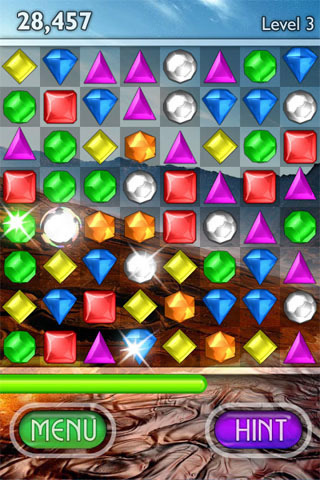 I don’t entirely get Bejeweled, to be honest. Classic mode ends when there are no more moves on the board, which strikes me as not fully under the player’s control, so at best arbitrary, at worst unfair. It just doesn’t work for me. Action mode is against the clock, and much more what I’m looking for when matching three. All perfectly servicable, and it definitely has the most interesting special blocks of three games, some requiring a little work to actually use them. The swishy wormhole-style graphics between stages, and incongruous photographic backgrounds are hugely enjoyable too. The Blitz element, on the other hand, is some sort of Facebook time attack thing, which I frankly can’t be doing with.